The Western Volcanic Plains are the third largest volcanic plain in the world. The volcanic plains extend 350 km west from Melbourne, almost to the border of South Australia, forming a belt roughly 100 km wide and covering approximately 20,000 square kilometres. The gently undulating plains are formed of lava flows up to 60 m thick, and are studded with volcanic hills. There are a range of soil types reflecting the age and degree of weathering of the lava flows. Grassland communities are dominated by grasses, with very few trees or shrubs. While grasses are the dominant plant form, they may not be the most frequent species. Victoria’s grasslands are floristically rich, meaning they support a great diversity of plants. There are not only grasses such as Kangaroo Grass, Wallaby-grasses and Spear-grasses, but growing between the grass tussocks can be many colourful native flowering plants including orchids, lilies, daisies and peas. There are often scattered shrubs on deeper soils, in drainage lines or near rocky outcrops. 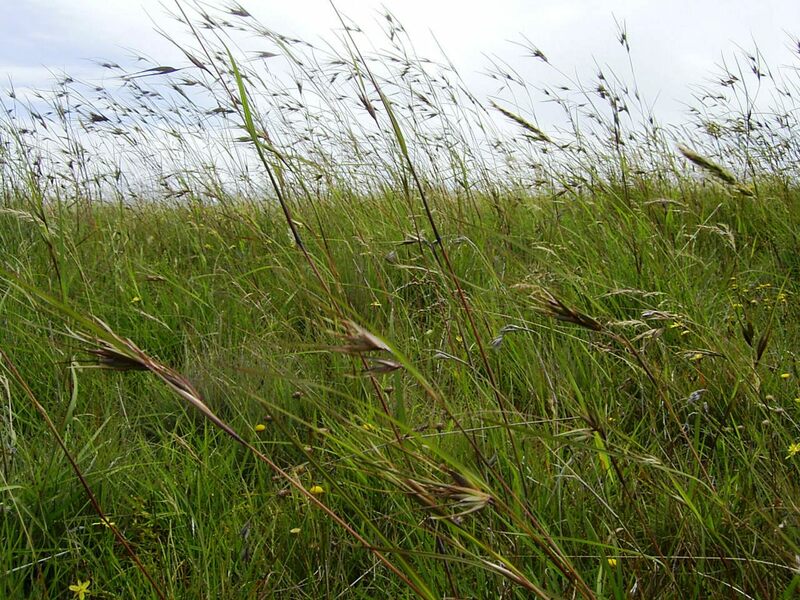 Grasslands exist throughout the world in temperate areas, including Australia and Victoria. Grassland ecosystems in Victoria are found in flat to gently undulating country at low altitudes in a range of geographic areas. These include not only the volcanic plains of south-western Victoria but also the calcareous sandy flats of the Wimmera, the alluvial plains of northern Victoria and South Gippsland, the higher-altitude hillsides of East Gippsland and the low country around Port Phillip Bay and Westernport. Grassland soils are generally volcanically derived or alluvial. They include relatively nutrient-rich loam, clay-loam and alluvial soils.In the Western Volcanic Plains, the fertile basalt soils are prone to cracking in dry periods and being seasonally waterlogged in wet periods. The Western Volcanic Plains grasslands occur in low to medium rainfall areas, from 400-1000 mm a year. Many of Victoria’s grassland plants are adapted to dry summers, wet winters, grazing by native animals, and frequent, low-intensity fires.They have a flush of spring and early summer flowering, perhaps as an adaptation to the rapid drying of the soil in summer. Some native grasses (e.g. Kangaroo Grass, Windmill Grass) use different chemical and morphological mechanisms for photosynthesis than most other plants. The C4 carbon fixation process is very efficient in hot, dry conditions and in soils with low nitrogen levels. It requires more energy than the typical C3 photosynthesis pathway used by most other species (e.g. Perennial Rye-Grass, Wallaby-grass, Spear-Grass) but releases far less water into the atmosphere. Having a mix of plants using these two different photosynthetic pathways allows grasslands to survive and grow during both drought and times of plentiful water. By comparison, traditional European pasture species are more productive but cannot survive well during Victoria’s weather extremes. The animals that live in grasslands include both vertebrates and invertebrates. Vertebrates include amphibians, birds, mammals and reptiles. Many grassland animals have developed adaptations, which enable them to live only in grassland ecosystems.